Mission Health, the not-for-profit health system that HCA Healthcare is looking to buy, announced Monday it will place $90 million into six hospital-level foundations in hopes they'll use the money to improve health in their communities. If the deal with HCA closes, Asheville, N.C.-based Mission will give $15 million to each of its five existing hospital foundations plus one that will be created for its Angel Medical Center, which doesn't currently have a foundation. The money would come in three annual payments of $5 million. Mission's foundations include the Blue Ridge Regional Hospital Foundation, CarePartners Foundation, Highlands-Cashiers Hospital Foundation, Mission Hospital McDowell Foundation and Transylvania Regional Hospital Foundation. The transition to being owned by for-profit HCA would necessitate a fundamental shift in how Mission's existing foundations allocate their resources. 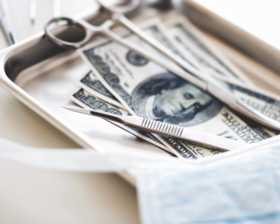 They could no longer earmark money directly to local hospitals. Instead, Mission's board chairman, Dr. John Ball, said they would need to change their legal structure under HCA's ownership and would likely refocus their strategy toward raising money for community health needs. "They're going to be going through a transition," he said. "We're hopeful that the monies from Mission will help in that transition, both building infrastructure, doing the kinds of needs and strengths assessments they'll have to do, hiring staff that has a focus on the health issues in the community and the like." Part of why Mission wants to ensure the strength of the local foundations is so they can help carry out the goals of Dogwood Health Trust, the not-for-profit foundation that would be created from the proceeds from the sale of Mission to HCA, which some have predicted will exceed $1 billion. Dogwood also won't legally be able to give money directly to the hospitals. Instead, it will work to improve the health and well-being of Western North Carolina communities through programming focused on social determinants of health, Ball said. "We recognized that Dogwood Health Trust was going to need to work through local community organizations: local United Ways, local departments of health, local not-for-profits," Ball said. "These foundations already existed in some of the communities. It would be reasonable then to fund them and support them because Dogwood could then be able to work through them." Given the roughly 900,000-resident region Dogwood would serve, Ball said the foundation would be the country's largest per capita. Mission's existing foundations have relatively small budgets, so $15 million would represent a sizable windfall. Blue Ridge's foundation took in revenue of about $368,000 in fiscal 2017, according to Mission. Its counterpart at McDowell Hospital reported revenue of $592,000 that year. Transylvania Regional Hospital foundation's revenue was $2.9 million, while Highlands-Cashiers' foundation reported $3.7 million. A Mission spokeswoman could not provide revenue for the CarePartners Foundation. Two of Mission's six hospitals, Transylvania Regional Hospital and Angel Medical Center, have unwind clauses in the agreements from their initial acquisitions that allow their boards to remove the hospitals from the health system. The boards of both hospitals voted to remain part of the health system. But that doesn't mean local residents aren't uneasy about the pending deal. An online petition to exclude Blue Ridge Regional Hospital from the sale has received more than 1,100 signatures. Another citizen watchdog group that formed in reaction to Mission's closure of inpatient labor and delivery unit at Blue Ridge last year has turned its sights toward ensuring services are preserved following the deal. That group has compiled a list of services it wants Mission to compel HCA to continue under the terms of their deal, including the Affordable Care Act's essential health benefits, such as maternity care, mental health treatment and emergency services. But Ball said local communities have a better chance at keeping their existing services under HCA's ownership than Mission's. "We've put in as much guarantee and procedural safeguards as possible to keep the programs going," he said. "On the other hand, as I've said, if Mission were to continue to own them, it would be more likely that those programs and services and even facilities would close because Mission simply doesn't have the scale to have the cost savings that HCA brings to the table." Ongoing negotiations with HCA are centered largely on price and which specific services the hospital chain will have to continue to provide and for how many years, Ball said. "There are some promises we've made to local communities for other kinds of services that we're negotiating with HCA to continue," he said. Mission, which holds a 49.5% market share across the 11 counties it operates in, expects to sign a definitive agreement within the month, After that, the North Carolina attorney general will have up to 90 days to review the deal. The Internal Revenue Service, the CMS and the Federal Trade Commission will also be able to review the deal.